Esther Price had a dream. To open a store. And share with the world her made-by-hand, made-with-love confections. So for 30 years, to the bliss of taste-testers, otherwise known as family and friends, she perfected a timeless selection of delectable sweets. In 1952, the doors to her first store in Dayton, Ohio swung open. And the world rushed in. Esther’s chocolates quickly became, and remain, the Midwest’s most beloved. Her secret? Some things are better sipped than said. Esther’s Li’l Secret. 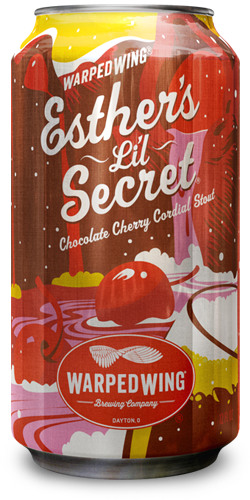 A decadently delicious Chocolate Cherry Cordial Stout. What’s your dream? This beer style changes every year. Attend our Esther’s Li’l Secret Launch Party & Reveal to find out what this year’s Esther’s Li’l Secret will be!